Stifle problems are very common in dogs. One of the most common injuries includes the rupture of the cranial cruciate ligament. Understanding the anatomy of the cruciate ligament is critical both in properly treating the injury and communicating the issues with clients. The stifle has 4 ligaments (2 cruciates and 2 collaterals) and 2 cartilaginous menisci. The menisci function as shock absorbers as well as stabilizers of the stifle joint. The cranial cruciate ligament is responsible for keeping the tibia from being displaced. It limits the tibia’s excessive internal rotation by twisting on the caudal cruciate ligament. It also prevents hyperextension of the stifle joint. The caudal cruciate ligament, on the other hand, works to prevent caudal displacement of the tibia. With the cranial cruciate ligament, it reduces excessive internal rotation of the tibia on the femur. An injury to the cruciate ligament is more or less related to their purpose: to minimize joint motion. Damage to the ligaments will happen when there is too much force involved in performing the function. Injury to the cranial cruciate ligament can be a result of trauma, or, more commonly, a degenerative process. The degenerative process is most often seen in the large breeds such as the golden and Labrador retrievers and the Rottweilers. Injury to the caudal cruciate ligament is very uncommon. When it does happen, it may have to do with severe trauma or stifle joint dislocation. The rareness of injuries to this particular ligament can be attributed to it being protection from extreme motion by other joints. Diagnosis is based on signalment, history and physical exam findings. The drawer sign test or tibial thrust are the diagnostic test of choice. The animal may need to be sedated for proper evaluation of an instability. However, ‘circumstantial evidence’ such as: appropriate signalment, chronic progressive lameness, worse with exercise, muscle atrophy, stifle effusion and medial buttressing (thickening on the medial aspect of the joint) are sufficient to warrant sedation for radiographs and evaluation of stability. An injury to any of the cruciate ligaments that is left untreated will result in degenerative changes in the joint. 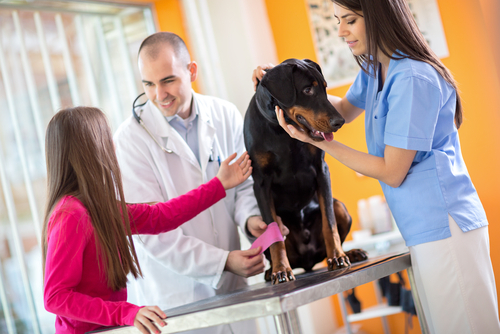 Surgery is the best option to treat the problem, especially in larger dogs. Many toy breed dogs will respond well to conservative management. The surgical procedures that can be done can be either intra-articular or extra-articular. The former uses a synthetic graft to replace the cruciate ligament while the latter attempts to stabilize the joint by modifying extra-articular structures. Consider taking our veterinary workshop on cruciates for more in-depth information, as well as earning veterinary continuing education credits.